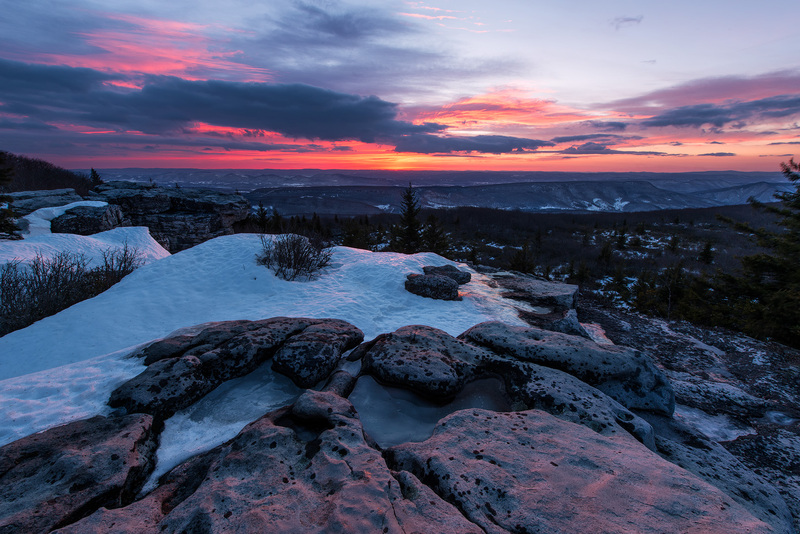 I have shot so many sunrises on Dolly Sods in the past six years but this image will go down as my most memorable image I have ever captured from this location –because suffering makes the difference! For me, it’s about the story and the shot and the overall vision, rather than just the adventure. I was driven to get this shot, for the past several years it’s been on my mind. I knew what it would take, I knew the elements I would be facing, and I knew it would be a very arduous 5 miles hike in knee-deep snow. I started my hike at 3 AM leaving me enough time so I’m not rushing up in sprint, and I actually reach Bear Rocks at 6 AM greeted by a horrendous wind that Dolly Sods is known for. While I’m sitting in a crevice trying to keep warm, my thoughts turn to why I elect to suffer so much? These are my thoughts; you have to suffer a little more to catch those moments that make all the difference. Photography to some extent involves a lot of luck; you have to be the one who is trying harder and putting yourself out there. Everyone has the same cameras now. The field has kind of leveled. But it takes a little more work to get those special moments. Everyone can buy the same cameras, but not everyone is willing to suffer as much for a shot. It’s what makes the difference.